A man has been jailed for stealing £690,000 from the company that fixes Sussex trains. Andrew Saunders, 53, of Benjamin Grey Drive in Wick, was today given a six-year prison sentence after being found guilty of fraud against Bombardier Transportation UK. The judge said he was unsettled by how Saunders tried to ‘trash’ his ex-wife to divert blame away from himself, police say. 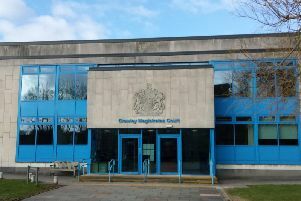 His co-defendant Roy George, 55, from Peacehaven, had admitted laundering funds from the fraud in relation to one of the companies involved, with a benefit of £261,347.65. He was given a two-year suspended jail term and ordered to carry out 300 hours of unpaid work. Saunders was manager of Bombardier’s Brighton site at Freshfields, and defrauded the company out of £690,000 by manipulating the payment system and paying the money into bank accounts held by him and his then-wife. He claimed that work had been done for Bombardier by her and his friend’s companies. However the money was ultimately circulated back to his own joint accounts and he led a lavish lifestyle which included purchase of Harley-Davidsons, a hot tub and holidays in the United States. Police say Saunders was the ‘mastermind’ but he involved George by getting him to set up one of the companies, RAS, for which fake courier journeys for train parts were created. George charged these non-existent journeys to Bombardier and Saunders authorised the payments. George then sent 51.4 per cent of the money he received from Bombardier back to Saunders and kept the rest of the money for himself. Detective Constable Fleur Jones of the Sussex Police Economic Crime Unit said; “This was a complex investigation which began when the fraud came to light in 2013, while Saunders was off sick from work and the anomalies in accounting were highlighted by one of his employees. “There was an internal investigation by the Company and the matter was reported to us. “The two men are friends and George used to supply legitimate courier services to Bombardier Transportation UK through his own company ‘Caddy Couriers’. “Andrew Saunders abused his position of trust as a manager within Bombardier Transportation UK and defrauded the company out of £690,000 over several years. “He used the money to live well beyond his means and pay for a lavish lifestyle. In doing so he betrayed the company and his team, who worked under him and who looked up to him for guidance. “George was drawn into this offending having been motivated by greed, however he pleaded guilty at an early stage of the court proceedings. “In sentencing, Judge Paul Tain said he was ‘disquieted’ by Saunders willingness to ‘trash’ everyone including his ex-wife, his company and his employees in an effort to divert blame and absolve himself of the offence, whilst being cross- examined.